I often forget to plan ahead and post a holiday-themed recipe before the holiday actually occurs so that you all can make it too, but this time I remembered! I am so proud of myself. I know a lot of people make ham as their main course for Easter, and one of the most popular side dishes for ham is a warm, creamy, cheesy potato casserole. I think almost everyone has eaten some version of these potatoes. When brainstorming a light version I ran across many similar recipes titled “funeral potatoes” which made me do a double take. I’m assuming the moniker comes from this dish’s prevalence at potluck gatherings, so I am incorporating potluck into the title instead of funeral. It just sounds more appetizing! I’m not always a huge sour cream fan, but I love the tangy flavor it brings to this dish. You can make this with the traditional cream of chicken soup, but it tastes just as good with cream of mushroom for a vegetarian option. This is a generous portion for a side dish, so make sure to leave room on your plate. The potatoes make really good leftovers too, so feel free to hide some before they’re all gone! Preheat the oven to 350. Lightly mist a 9 x 13 baking dish with cooking spray and set aside. In a large bowl, combine all the ingredients except the corn flakes and stir until thoroughly combined. Pour the mixture into the prepared baking dish and spread evenly. 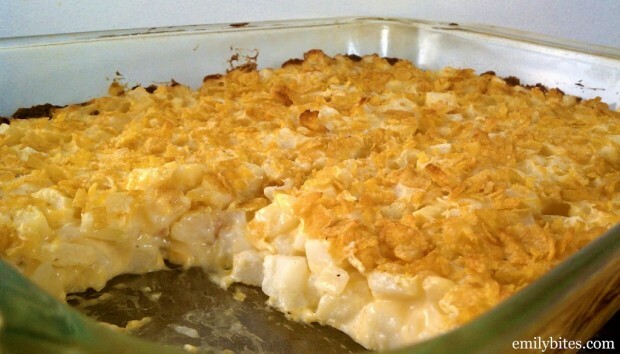 Sprinkle the corn flakes over the top and bake for one hour until potatoes are cooked through. Slice into eight pieces and serve. ooo, I bet you could even substitute greek yogurt for the sour cream for the added protein. I can’t wait to try this recipe! By the way, Emily. Everything I’ve made from this website ——> ROCKS! 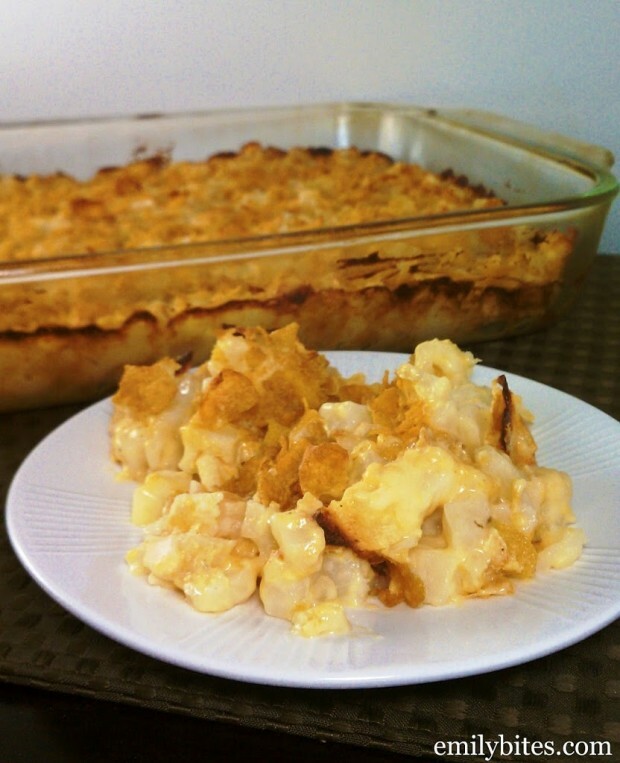 we have always called them funeral potatoes and yep we have them every Easter…thanks for lightening it up! I get 4 points with the nutritional info, but 7 points entering it into the recipie builder. That’s a big difference, but still better than the original recipie. I have no idea how you would get that because when I run the exact ingredients I listed through the recipe builder I get 5 per serving. Thank you! Adding this to my Easter menu. I hope they’re a hit! Happy Easter! Made them as 16 cupcakes!!!! They were amazing!!! I have lost 15 lbs so far all by eating Emily bite recipes! What a genius idea to make them into cupcakes!! I am going to try that next time. would you still bake 1 hr. also are points still 5 points per cupcake? and is serving size 1 or 2 cupcakes? thanks for any info!! Thanks, Lauren! Hope you like it! Getting ready to put mine in the oven. Hubby wanted shredded potatoes though. I’ll let you know how it goes. I hope they were a hit, Wilma! I made these for a side dish to our Easter dinner, and they were good! I substituted 1/2 C seasoned bread crumbs for the corn flakes, and the points came out the same. I used shredded potatoes, as the store I was at didn’t have the cubed / diced potatoes. I’ll be making these again! Thanks for the recipe! I made these for Easter brunch. They turned out amazing! I’ve tried another version of this recipe and this one is WAY better. I absolutely love all your recipes. My boyfriend is pretty skeptical when I make “healthy” recipes, but he has liked every recipe that I’ve made from your website (bubble up enchiladas are his fave, he’s learned how to make them too!). Thanks for all your wonderful recipes! Yay, I am so glad you loved this dish! Thanks so much for the kind words. I’m glad your boyfriend is becoming a believer :P.
This is a wonderful recipe! For breakfast I warmed up 1 serving of potatoes, and topped with a cheese single and fried egg. Only 8 points for a very filling breakfast thatkept me full until lunchtime. Sounds like a yummy breakfast to me! Thanks for sharing the idea. Glad to hear you liked these! If you bake the cheesy potluck potatoes in a cupcake pan would you still bake 1 hour and also would each serving still be 5 points per muffin or less? Sorry, I’ve never made them that way, so I have no idea. If you try it out let us know! These potatoes made an excellent side dish for my pork roast and asparagus dinner! Thanks for this easy to make and delicious to eat recipe. PS – In St. Louis we call this casserole “Party Potatoes” – I guess the name of the dish depends on where you live! These are amazingly good. My sister’s recipe is similar, but uses a stick of butter. The first time we made it, she said she didnt’ miss the butter at all and it didn’t have all that grease floating everywhere. No one commented on the swaps as being noticeable either. The next time she made it she “insisted” she had to have some butter, so I made mine separate. After dinner she commented that I should have reminded her leaving out the butter was okay & she didn’t miss the flavor. I told her to sprinkle butter buds on her portion if she wanted. We are having it regularly now; without unnecessary fat & still amazing taste. Thanks so much for posting this…I thought I would never get to have it again. Another great recipe Emily, thank you so much. Made these tonight. Very good!! Except next time, I am going to cook the onions beforehand so they are softer. Love your blog! Making these today to go with grilled pork tenderloin. I’ve made the full fat version for many years, so I am so happy to have this lightened up! Thanks! I am using Italian Panko on mine this evening I will let you know! I too will be trying this with Panko as that is what I have on hand. I’m giving these a try tonight with some pork chops. I can’t wait!!!!!!! I know they’re going to be amazing. BTW, I absolutely LOVED the taco bake as well as the chicken enchiladas. The buffalo pulled chicken was a hit as well! We ate them as bbq pita pizzas and bbq chicken nachos. Delicious! Ok, these were AMAZING!!!!! Definitely integrating this into my usual repertoire. I had them with a pork chop for supper tonight and plan to have more for breakfast with an egg haha! Good job!!!!!! What is the serving size for these Emily? Making these for easter but going to sprinkle crushed lowfat cheeze its on top! made these in a cupcake pan(1/2 cup each) baked them for an hour point value was 3 for 1. These are delicious! Had them last night…just curious, about how much potatoes are in a serving size (didn’t break it into eights last night since we were serving a crowd). Would you estimate about 2/3 C? I like to steer clear of processed foods, so the frozen hash browns wouldn’t work for me. What’s the word on using fresh cubed potatoes? Any variation on the cooking time? As long as you chop them up small it should be about the same! Thank you So Much for lightening up this recipe. My Grandma used to make these for everything from Easter dinner to Xmas morning, and I often have craved them when I am missing her. This allows me to make them, think of her, and not depth-charge my WW mission. How long do you bake these for? Do you think this recipe would do well in a crock pot? I’ve never tried it that way – if you do, report back and let us know! Make these all the time in a crockpot and they are great. It looks delicious, however I do have to say that cream of mushroom soup isn’t truly vegetarian. It contains anchovies. I’m sure that there is a substation though! This might be a really dumb question, but do you measure the cornflakes first, and then crush them, or crush and then measure 3/4 cup? I feel like this would make a difference. I always just buy corn flake crumbs which come already pre crushed so crush them first! Emily, thank you for coming back to respond! It turned out great – just the right amount of corn flakes! I hope you are enjoying your maternity leave time.